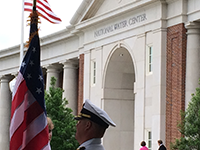 The NWC serves as a catalyst for the Integrated Water Resources Science and Services (IWRSS) partnership. IWRSS consists of NOAA, the U.S. Geographical Survey and the Army Corps of Engineers as its initial members. The partnership is unifying and leveraging each agency's expertise and investments to improve water resource forecasts, understand how water moves across the land and rivers and facilitate creative and informed decisions, all utilizing the best available science. Dr. Louis Uccellini, director of NOAA's National Weather Service, said the NWC is becoming the starting point for new hydrology research and operations in the United States. The NWC benefits research partnerships between University of Alabama experts as well as experts at other universities nationwide. Students have a special opportunity to gain from a research experience and other opportunities at the NWC. The NOAA National Water Center (NWC) is one of the locations of the NOAA Office of Water Prediction, and it is the first federal national water resources facility in the country. The beautiful new building is located on the University of Alabama's campus. NOAA received a $23.5 million authorization to design, build and equip the facility. The contemporary new facility includes an operations center with situation rooms, a geo-intelligence laboratory, collaborative science and software engineering studio, systems proving ground and a distance-learning classroom and auditorium. The building offers many collaborative workspaces, hangout rooms and a lot of natural light throughout. New opportunities are listed on the UCAR Career Portal and as Opportunities on this website as they become available. The University of Alabama, the State of Alabama's oldest public university, is a senior comprehensive doctoral-level institution. The University was established by constitutional provision under statutory mandates and authorizations. Its mission is to advance the intellectual and social condition of the people of the State through quality programs of teaching, research, and service.